The Distinction Wood Cremation Urn is available in cherry wood with a dark cinnamon stain and a satin finish. A stylish footed base, traditional top molding and framed oval front plate provides a striking accent. 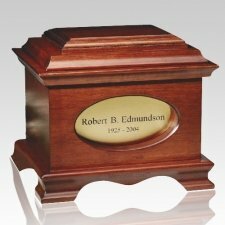 A Free Urn engraving is included with this urn. "I just wanted to say that I am extremely pleased with my purchases from Memorials.com. After having to deal with very uncooperative family members who felt that they needed to take my father's remains out of the box that the funeral home put them in, and mail them to me in a brown cardboard box, I am extremely grateful that he will now have a proper place to rest. The urn that I purchased was even nicer than the pictures showed on your website. "I was very impressed with the selection and price of your items. The website was very user friendly and the urn we ordered was absolutely beautiful." Haley H.